Two main problems... first of all the fitting of the 100mm rifled medium gun in a slightly offset centre position led to problems with cracking because recoil was not centred so were concentrated in places it should not have been. To add a 45mm or 57mm gun would be much worse as these would be much more powerful guns with much more recoil. the second problem of course is that the 40 rounds the BMP-3M carries of 100mm HE shells occupies most of the lower turret area so if you are keeping the 100mm gun there would be no room for 45mm rounds or 57mm rounds for that matter... 220 of which would actually take up more internal space than the 40 x 100mm rounds which are actually smaller. In any case the 45mm and 57mm would be a good replacement for both the 30mm cannons and 100mm cannons. while they don't have the enormous rate of fire of the 30mm gun the guided shells means the kill probability is much higher with aimed single shots, and while each shot is not as powerful as a 100mm shell the high hit probability means fewer shots will result in more effective damage because you will be hitting what you are aiming for. At the opening September 9, 2015 in Nizhny Tagil, Russia Arms Expo 2015 (RAE-2015), OAO "Kurgan Machine-Building Plant" will demonstrate two new versions of the BMP-3, referred to as "Dragoon" and "Derivation". "Derivation": BMP-3 with 57-mm automatic cannon (apparently, the A-220M). 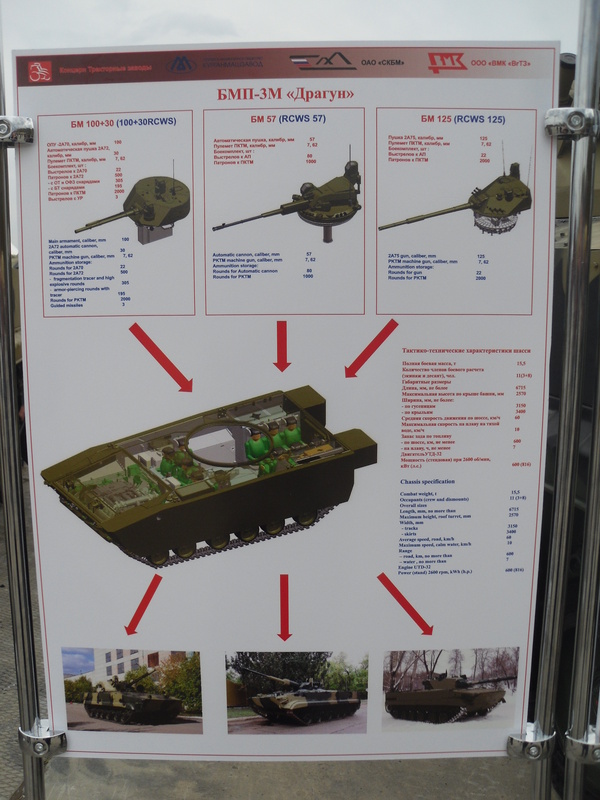 "Dragoon": Reconstruction of BMP-3's to locate the engine compartment at the front and with the installation of remote-controlled weapon stations, preserving the main armament of the BMP-3, 100mm gun 2A70, and coupled with her 30mm automatic cannon 2A72. George1 wrote: At the opening September 9, 2015 in Nizhny Tagil, Russia Arms Expo 2015 (RAE-2015), OAO "Kurgan Machine-Building Plant" will demonstrate two new versions of the BMP-3, referred to as "Dragoon" and "Derivation". New front bolt-on protection....Da, Da, Da! NIZHNY TAGIL, September 10. /TASS-DEFENSE/. An advanced version of the Russian infantry combat vehicle BMP-3, designated as Dragun, has become the most maneuverable in the world. This conclusion was made on the basis of the Dragun’s tactical characteristics released for the first time at the Russia Arms Expo-2015 international exhibition. The advanced infantry combat vehicle was fitted out with the UDT-32T diesel engine with bench power of 816 hp. As a result, the Dragun’s power-weight ratio reaches 38 hp/ton. The power-weight ratio of the US M2A3 Bradley IFV equals 19.74 hp/ton, the German Puma 25.5-34.59 hp/ton, the French VBCI 18.6 hp/ton and the British FV510 Warrior 23.5 hp/ton. Unlike the majority of foreign infantry combat vehicles, the Dragun has retained its floatability and capacity to cross rivers. This version of the BMP-3 is also equipped with a prototype of a remote-controlled combat module with cannon armament. Looks like GarryB, and myself were wrong. We thought that the front-engined BMP-3 configuration would lead to sacrificing the ability to float and cross rivers, thankfully I'm glad to be wrong on this issue. can be put two guns on top of each other while manevrate each separate? Almost certainly slated for export, unless they order more BMP-3's which to me would be a mistake when you have Kurganets-25 around the corner. BMP-3 Dragoon the Pic Layout. New 800HP! Who knows if they want a front-engined BMP-3, they may as well get a Kurganets-25. so the new BMP-3s that Russian Army ordered will be this model?? I was also curious about the most recent BMP-3 order, if they are going for the new engine layout +/+ unmanned turret, or keeping fleet commonality...? The sheer plethora of different armour coming out of Russia at the moment is really putting everyone else to shame. mutantsushi wrote: I was also curious about the most recent BMP-3 order, if they are going for the new engine layout +/+ unmanned turret, or keeping fleet commonality...? No sure but I read the note. Rear doors show crazy armour for structural weight. Russians, witchcraft isn't allowed. What are the 2 extensions at the back on both sides of the doors? Possibly Aircon and Comms with Crew. Serves also as protection for desants. The extensions are probably to prevent enemies shooting into the rear of the vehicle from a wide range of angles when the rear doors are open. I suspect this new design of the BMP-3M would be a bit like Pantsir-S1 where foreign money has perfected a system beyond what Russian Army money would have been spent to create, but that the fruits of their labour will eventually benefit the Russian military and the international export market. This version will no doubt be modular and allow export well before the Kurganets or Boomerang or Armata or Typhoon vehicles are ready for export. The three crew positions likely share some commonality with the systems mounted in the new vehicle families saving costs with larger production runs. TheArmenian wrote: What are the 2 extensions at the back on both sides of the doors? Would make sense, AFAIK the fuel tank was part of the door in the BMP-1/2 series at least (not sure about BMP-3), so they would probably have the fuel somewhere nearby in that region one way or the other. Those two rear bulks could also fit smoke screen APS system similiar like on Kurgnets, T-14 and T-15 to camoflauge vehicle from top attack weapons of IR/IIR spectrum. Not exclusive for that system but i think it could be accomodated in there nicely and compact.